East Link Extension is a 14.5 mile long light rail transit (LRT) extension connecting the east side to the west. Image: courtesy of wings777. The East Link Extension will have a total of ten stations that will provide services to Seattle, Mercer Island, Bellevue, South Bellevue and Overlake in Redmond. Image: courtesy of Sound Transit. The project plans also include pedestrian, bus, bike and vehicle access with parking space for 700 bikes and more than 2,400 vehicles. Image: courtesy of Sound Transit. 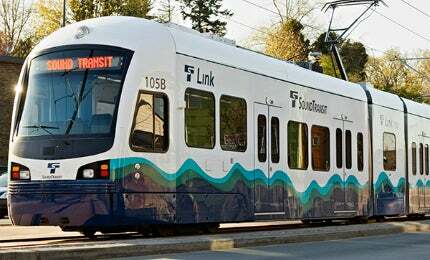 The project will be operated by Sound Transit. Image: courtesy of Sound Transit. East Link Extension is a 14.5 mile (23.33km) long light rail transit (LRT) planned in Seattle to connect the biggest and heavily populated Eastside areas with downtown Seattle, Sea-Tac Airport and the University of Washington. The project is undertaken as part of the regional light rail system that serves more than 50 miles (80.4km). The East Link Extension will have a total of ten stations that will provide services to Seattle, Mercer Island, Bellevue, South Bellevue and Overlake in Redmond. It will be operated by Sound Transit and is anticipated to witness approximately 50,000 riders by 2030. Project plans also include pedestrian, bus, bike and vehicle access with parking space for 700 bikes and more than 2,400 vehicles. A memorandum of understanding (MOU) was reached between Sound Transit and the city of Bellevue in April 2015 that ensured the city’s financial aid to the project and also permitted to begin construction. Construction is expected to start in 2016 with an aim for completion in 2023. The project cost is estimated to be $2.8bn. "The project is undertaken as part of the regional light rail system that serves more than 50 miles." The new line will run between Redmond and South Bellevue on the east shore and continue to Mercer Island and downtown Seattle through the I-90 (Interstate 90) floating bridge. The final stop will be the International District/Chinatown station, where other connections will be available to the Central Link Light Rail line operating between downtown and Sea-Tac International Airport. The project received a $14m grant from the US Department of Transportation (USDOT), $185m in cost sharing by the city of Bellevue, and local funding of $2.2bn. Microsoft contributed $33m for a bike/pedestrian bridge to be constructed at the Overlake Transit Center Station, while the city of Redmond contributed $10m. The project will add four new light rail stations at Morrison Creek, Franklin, Center Parkway and Cosumnes River College, and involve construction of two new light rail bridges. The ten stations of the new line will be Judkins Park, Mercer Island, South Bellevue, East Main, Bellevue Downtown, Wilburton, Spring District/120th, Bel-Red/130th, Overlake Village and Redmond Technology Center. Judkins Park station will be located in the centre of I-90 and will have entrances on both Rainier Avenue South and 23rd Avenue South. It will link important employment centres and aid in the overall development of Seattle. With entry from 77th Avenue SE and 80th Avenue SE, the Mercer Island station will also be located in the centre of I-90 and will be close to Mercer Island park and ride lot. South Bellevue station will be constructed on the site of the South Bellevue park and ride located on the Bellevue Way SE. It will also include bus and paratransit facilities along with 1,500 parking stalls. East Main station will be at street level and will be located south of the intersection of 112th Avenue SE and Main Street. Bellevue Downtown station, located at NE 6th St, will service Bellevue and will be situated close to the present transit centre. Wilburton station will be an elevated station located north of NE 8th Street with two entrances. The Spring District/120th station will be built below street level between 120th and 124th avenues NE, in compliance with development plans of the city of Bellevue and Spring District redevelopment. The Bel-Red/130th Station will be located between 130th and 132nd avenues NE at NE 16th Street. Overlake Village station will be located north of the Overlake Village park and ride on 152nd Avenue NE with entrance along 152nd Avenue NE. Redmond Technology Center station will be built at the site of the existing Overlake Transit Center and will be an important travel hub. Hill International will provide project management services for the East Link Extension project. H-J-H, a joint venture of HNTB, Jacobs and Hatch Mott MacDonald, was awarded a design contract worth $88m for providing services for seven miles (11.2km) of double-track light rail transit, eight stations, a cut-and-cover tunnel in downtown Bellevue, and long-span bridge crossings over Interstates 405 and 90 for the South Bellevue to Overlake Transit Center portion of the East Link extension. Sound Transit appointed the joint venture of Stacy and Witbeck and Atkinson (SWI and Atkinson) as the general contractor/construction manager (GC/CM) for 12 separate projects of the East Link Extension. Perkins+Will in collaboration with LMN architects was selected to design the ten stations.